The NordicTrack A.C.T Commercial 7 Elliptical is a high tech elliptical machine that has an attractive home- friendly design. It supports an adjustable stride, which in return helps to personalize your workout according to your own. Its oversized pedals helps for a comfortable workout, while its iFit compatibality helps for a world class training. Monitor your workout progress on its large 7" Full Colour Touch Display and stay motivated. Besides it also has many other features like heart rate monitor, transort wheels, upper body grips, water bottle holder etc. Stride Length 18", 20", 22"
Frame- Lifetime, Parts- 5 year and labour- 2 year. *Note: Most of the sites, stores or shopping portals listed above sell NordicTrack A.C.T Commercial 7 Elliptical with discounts and other exciting offers. There is a possibility that the some of above websites are not selling NordicTrack A.C.T Commercial 7 Elliptical now. Toughtrain.com is not liable for such cases or instances. 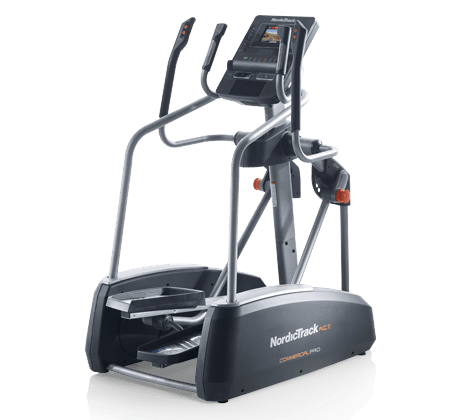 Also we do not recommend any seller for NordicTrack A.C.T Commercial 7 Elliptical and a buyer should buy from where he/she gets best deal with quality of products, service and on time delivery (shipment).